Build yourself a hard-bitten professional fighting man. 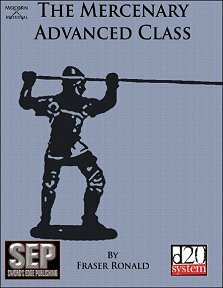 Publisher's blurb: "The Mercenary Advanced Class presents a view of one of the enduring images of the High Middle Ages and the Renaissance, the professional soldier. Presenting both a modern d20 and fantasy d20 version, this product presents the Mercenary as more than a fighter for hire. This Mercenary is the master of the battlefield."